Dr. Rosa Vallejos Yopán holds a joint appointment in the Department of Linguistics and the Department of Spanish and Portuguese at The University of New Mexico. She offers undergraduate and graduate level courses guided by her teaching interests, which focus on language contact, (Spanish) functional morphosyntax, and Native American languages. 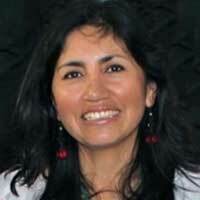 Her research is centered in Amazonia, one of the most diverse areas of the world. Since 1997, she has conducted several projects to study three typologically distinct languages: Kukama-Kukamiria (Tupían), Secoya (Tukanoan), and Amazonian Spanish. The applications of linguistic research to real-world issues are what motivate her studies, with an overarching principle being to document cultural and linguistic phenomena in order to create resources that support communities’ self-determined goals. She is co-author of Diccionario Kukama-Kukamiria Castellano (2015) and author of A Grammar of Kukama-Kukamiria: A Language from the Amazon (2010).